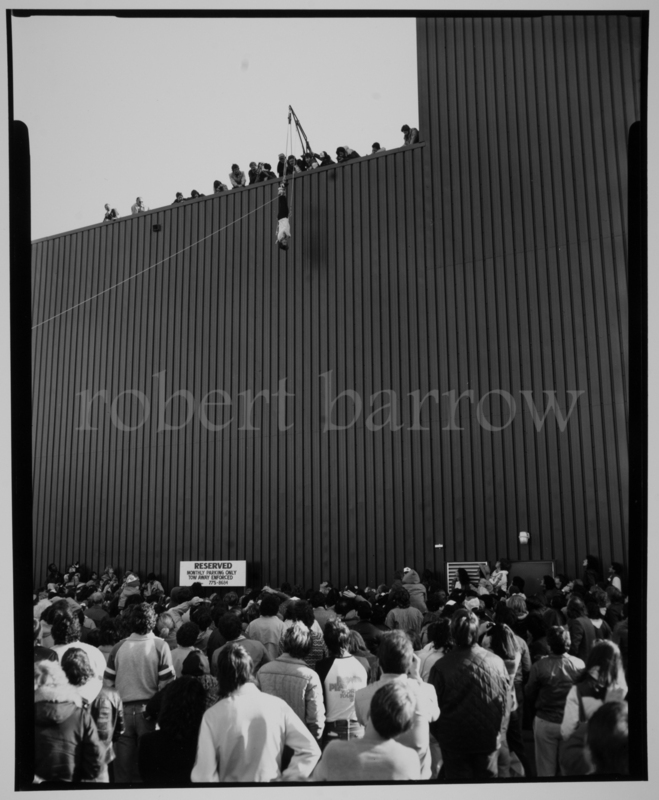 “Long Views – Short Events” is a project I began somewhat accidentally in 1982 with a photograph of Dean Gunnarson effecting a straitjacket escape while suspended from the Winnipeg Free Press Building. For the series, I worked with a photographic relic from another time, a Crown Graphic 4×5 Press camera and, in a classic case of the tool shaping the user, began to photograph events from the distanced perspective of an earlier era. 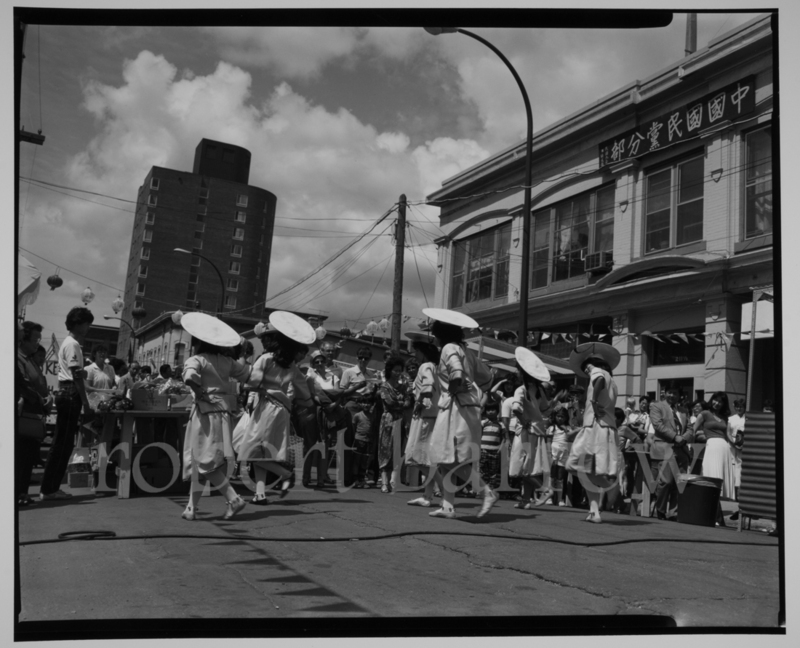 The project culminated in 1989 with my attempt to photograph an event a day through July and August. While the photographs are not in the style of earlier photojournalism, nor the events exceptionally newsworthy, I hope they step away and visually answer the journalists questions; Who, What, Where, When, Why and How? However, I am providing captions for further clarity. Watch the slide show immediately below or scroll through to read the captions. Please feel to add comments or recommend to a friend. Dean Gunnarson recreates Houdini’s escape from a straight jacket on the anniversary of Houdini’s death, Winnipeg Free Press building, Carleton Street, Winnipeg MB October 31, 1982. On February 21st, 1923, Houdini had spent two minutes extricating himself from a strait jacket while suspended from the Winnipeg Free Press Building. Opening of Window Park with Mayor Bill Norrie at the podium, Carlton Street and Portage Avenue, Winnipeg MB 1985. So many great photos. One of my favourites is the (stilted) street performers crossing the road, the one with Sushi the dog, and the Morris family buffet. The stories. And it’s always so interesting to see your city as it was… The Forks under construction, and what Old Market Square used to look like, and more. Thanks Rob. Love seeing your photos over the years! One of my favorites here is “Sarah” licking the icing off of the knife….YIKES. So that’s where all the people were! The humans so conspicuously absent from “Winnipeg Views” are packed into “Long Views—Short Events.” It’s like a different city—so much variety and texture and life. Thanks for taking and sharing these, they are a real treat. Always enjoy your unique perspective Rob. Thanks for this – so many memories. Great photos bringing back lots of memories. 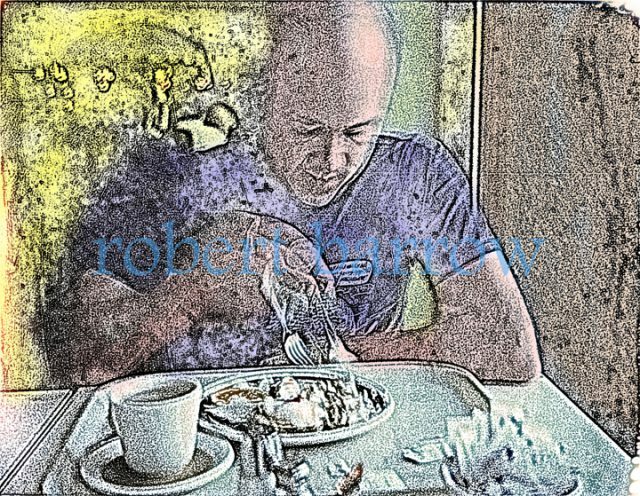 Nice work, Rob, and thanks for sharing!